If your Plan wants to decrease and control its costs, you need your PBM to take advantage of every Specialty Drug savings opportunity. Unfortunately, many – if not most – PBMs fail to do so. Zytiga, a high-cost treatment for metastasized prostate cancer, now has a far lower-cost generic substitute available, called abiraterone. Litigation hangs over the generic opportunity, but significant savings are still available. However, your PBM must act for those savings to materialize. Below we provide a basic background on Zytiga, a brief description of the litigation cloud, an explanation of the savings your Plan can obtain from using generic Zytiga, and our recommendations for actions your Plan should take to obtain those savings. Zytiga is a treatment for prostate cancer that reduces a man’s testosterone and thus potentially slows down the disease’s progression. The FDA initially approved Zytiga in 2011 to treat metastatic castration-resistant prostate cancer that had not responded to other treatments, including docetaxel. In 2018, the FDA added an indication and approved Zytiga to treat high-risk castration-sensitive prostate cancer. Although Zytiga was heralded by oncologists when it was first approved, the main clinical trial relied on by the FDA for approval showed the drug did not cure cancer and had only a limited impact on longevity: Median survival for patients taking Zytiga was 14.8 months compared to 10.9 months for patients taking a placebo, meaning overall survival increased by 3.9 months. This finding was “confirmed by the updated overall survival analysis … [showing] a median survival of 15.8 months versus 11.2 months,” meaning extended longevity of only 4.6 months. Also, 10% or more of men experienced joint swelling/discomfort, muscle discomfort, hot flush, diarrhea, urinary tract infections and/or coughs. Despite Zytiga’s limited efficacy and not-insignificant side effects, men are likely to take the drug for at least three reasons. First, there are no better drugs available. Second, many doctors don’t provide information to their patients about drugs’ efficacy or side effects, and many patients don’t ask. Third, if doctors do provide information, they often state that Zytiga can extend life by 33% or more, which while true, fails to identify that the likely added months of life are few. Therefore, men are likely to continue to use Zytiga, and every Plan that wants to control its costs needs to pay attention to Zytiga. In late October 2018, a U.S. district court ruled against Janssen’s patent infringement claim and thus opened the door to generic competition. Janssen immediately announced it intended to appeal the ruling. As a result, the district court ordered generic launches to be stayed until Janssen’s preliminary injunction could be heard on appeal. However, in November 2018, a federal appellate court rejected Janssen’s request for a temporary injunction, clearing the way for generics to launch. Janssen immediately announced it would pursue an injunction against generic launches before the Supreme Court, but that case will not be heard until later this month. If the request for injunctive relief is again denied, Janssen’s substantive case claiming patent infringement may still be heard on appeal. Meanwhile, at the end of October 2018, the FDA approved four generic manufacturers’ applications to market a generic version of Zytiga: Teva, Mylan, Hikma and Apotex. [ Therefore, generic versions of Zytiga are now available under the name abiraterone. Should the Supreme Court later this month grant Janssen’s request for an injunction against generic launches – or the federal appeals court or Supreme Court eventually hold that generic manufacturers infringed Janssen’s patent – any generic manufacturer with sales could be hit with a lawsuit by Janssen for damages. However, this possibility will have no impact on Plans. Moreover, if Plans act now and Janssen loses in court, Plans will have saved money for many months and will continue to save thereafter. If your Plan has beneficiaries using Zytiga, it’s likely your Plan is spending large sums of money on Zytiga for every male receiving treatment. Depending on the AWP discount provided by your PBM, your Plan’s per person treatment cost is likely between $9,000 and $12,000 per month. Note that men taking Zytiga often take it for many months, meaning your Plan’s per person annual costs likely range from just below, to somewhat over, $100,000. The newly approved versions of generic Zytiga are far less expensive than brand Zytiga, and generic prices may fall in the future given increased competition. Current wholesale acquisition costs for generic Zytiga are approximately $3,800 per person for a monthly treatment. Thus, annual per person treatment costs for generic Zytiga are approximately $45,600, rather than +/- $100,000 for brand Zytiga. In short, if generic Zytiga is substituted for brand Zytiga, a Plan’s monthly savings will be approximately $5,200 to $8,200 per person treated. A Plan’s annual savings will be approximately $62,400 to $98,400 per person treated. We’ve contacted – or reviewed the actions of – several PBMs to determine if they are acting to ensure their clients obtain financial savings by requiring use of generic Zytiga. Unfortunately, many PBMs have not acted. However, some have. United Healthcare’s Optum – one of the three largest PBMs – has placed abiraterone on Tier 1 of several of its formularies, but has not blocked brand Zytiga. Navitus – a mid-size PBM known for its aggressive efforts to decrease costs – has blocked brand Zytiga on its standard Formulary, will only dispense generic Zytiga, and has placed Zytiga on Tier 2 (for Plans with 3 Tier Formularies) and Tier 3 (for Plans with 4 Tier Formularies). Note that it’s a thorny matter to decide the best tier placement for generic Specialty Drugs, particularly when the Brand Drug is not blocked. If a PBM – or Plan – wants to ensure beneficiaries use the generic – and the Brand manufacturer is distributing copay cards to eliminate or greatly reduce copays for the Brand – the generic needs to be placed on a low-cost tier, or beneficiaries won’t use the generic. Therefore, Tier 2 or even Tier 3 placement for generic Zytiga makes sense given its high cost, as long as you ensure beneficiaries will have access to copay assistance. Our ongoing clients have a contractual right to customize their Formularies, as well as a contractual right to obtain drug-by-drug rebate information from their PBMs. Therefore, our firm is now investigating the “net cost” of brand Zytiga (factoring in all Zytiga rebates), and comparing that cost to generic Zytiga’s available cost. And we are making immediate recommendations to our ongoing clients based on our analysis. Also, we are asking relevant PBMs about the “net costs” (factoring in rebates) for therapeutically similar Xtandi and Yonsa in order to make recommendations to our ongoing clients about inclusion and tiering of those drugs as well. But it’s reasonably likely your Plan does not have a contractual right to customize its Formulary, let alone obtain “net cost”, drug-by-drug rebate information. Instead, you are likely contractually bound to use one of your PBM’s “standard” Formularies. And your PBM probably has the contractual right to keep you “in the dark” about rebates. Even so, we urge you to contact your PBM and ask about the “net costs” of each of the relevant drugs. Given the savings opportunity, you certainly have the right to know! Assuming your PBM refuses to disclose the relevant information, we urge you to require your PBM to put in writing that it is in fact pursuing a lowest-net-cost approach in this therapeutic category for your Plan. Your PBM is likely to respond by saying you have no right to obtain this assurance – the PBM’s only obligation is to act in its clients’ aggregate interests, not your Plan’s specific interests. But you should reject this misleading claim. After all, your Plan is relying on a “standard” Formulary that a large number of the PBM’s clients are also using. Therefore, your interests are aligned with its other clients’ interests, and your PBM should be willing to state in writing that it has taken action to favor the lowest, net cost drug for all such clients. The appropriate dosage level for treatment is 1000 mg. daily. This can be obtained if a man takes four 250 mg. tablets daily, or two 500 mg. tablets daily. Currently, generic abiraterone has only been approved in 250 mg dosages, while brand Zytiga was approved at both dosage levels. Therefore, when comparing brand and generic costs, pay attention to (i) total cost per day for the brand and generic based on ensuring the necessary total dosage level; (ii) the PBM’s guaranteed discount for the brand and the generic; and (iii) any pass-through rebates you will obtain for the brand. Assuming your PBM is unwilling to provide the above information, here’s our final recommendation: Pressure your PBM to block Zytiga and make generic Zytiga available immediately. Generic Zytiga is almost certainly less expensive, even when factoring in possible brand rebates. Unless Plans pressure PBMs to take action to reduce Plans’ costs, PBMs won’t take the necessary actions to maximize Plans’ savings. Plans must also create pressure on brand drug manufacturers if we want them to change their pernicious pricing practices. When brand Zytiga was initially approved, its average cost was about $5,000 per month. As mentioned, today its cost is approximately $9,000 to $12,000 per month. Moreover, it’s extremely likely Janssen will raise Zytiga’s list price even further in the coming months to maximize its profits now that there is generic competition. The marketplace needs to respond negatively and stop using brand Zytiga, if Janssen and other manufacturers are to learn a lesson. We’ve written articles explaining the steps every Plan should take to decrease its Specialty Drug costs. You can read those articles here and here. Bottom line: If you want your Plan to decrease its costs, you need to position your Plan contractually to “take charge” of your prescription coverage. You cannot “trust” your PBM to act in your Plan’s interests. .
Alternatively, you may want to join our National Prescription Coverage Coalition. We have already put in place a PBM contract that contains all the above provisions. Our Coalition also provides ongoing assistance to each Coalition Member to make customization decisions and to respond to numerous marketplace developments, like the entry of generic Zytiga. As a result, our Coalition Members achieve continuous savings and control their prescription coverage costs on an ongoing basis. To read more Drug Savings Drug Alerts, go to the Top Menu Bar, and click on RxAlerts. 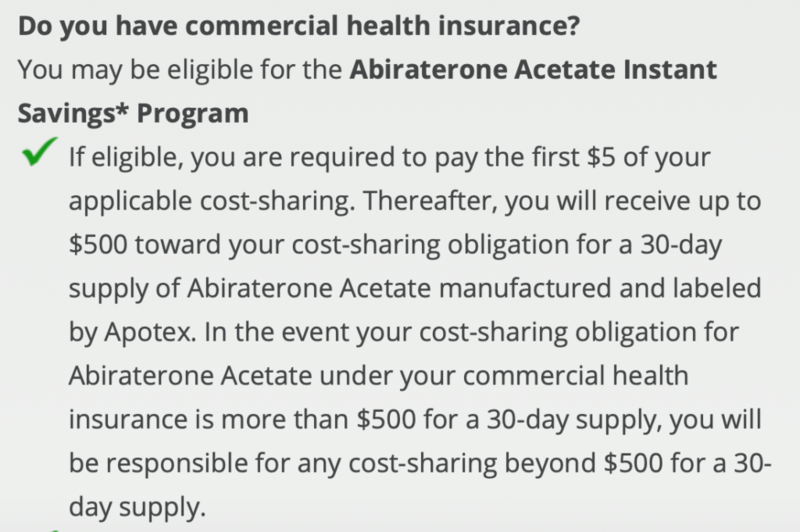 Note: If your PBM – or Plan – places Zytiga in Tier 2 or Tier 3, and your Plan’s Benefit Design requires coinsurance for the relevant tier (meaning the beneficiary is required to pay a percentage of the total cost of the drug), you should evaluate whether the generic manufacturer’s $500 copay assistance “cap” will preclude beneficiary access.